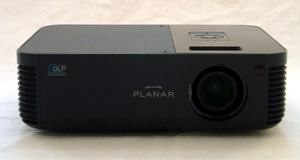 Planar is a relatively new projector manufacturer, but their products show that they have what it takes to be competitive. The Planar PR5020 is a 3000 lumen, 7 pound light cannon that sells for the attractive price of only $1299. With many features normally reserved for more expensive models, the PR5020 is a versatile and capable performer. Light Engine: 1024x768, native 4:3 single-chip DLP with a 200W lamp. Connection Panel: One DVI-D, one VGA, one VGA-out/monitor passthrough, USB/RS232 ports for computer connections, composite video, s-video, stereo RCA audio input, 1/8" audio in/out, kensington lock.